Welcome to the Printing Partners Varnish Guide. Select the type of varnish method you would like more information about. Varnish refers to a coating applied to your printed piece during or after printing. A varnish is typically added to a piece to enhance the look or to protect the piece from scuffing or scratching due to handling or contact with moisture or chemicals. There is a difference between a varnish and an aqueous coating, see below. A spot varnish is a varnish that is put on only a portion of the page. 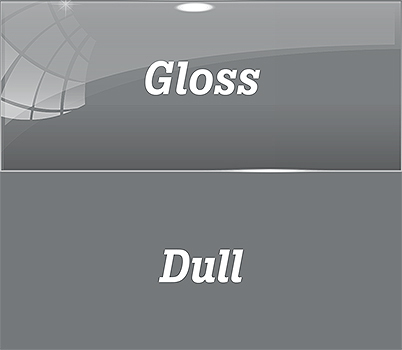 It can be gloss or dull and is used to highlight or emphasize a photo or text, or can be used as a subtle design element. A spot varnish requires that a special plate be created for the press. It is treated like it is an additional color. Spot varnishes can be solids or screens; you can have almost as much control over a spot varnish as you would a spot color. Some spot varnishes can also be tinted to create an effect. If your printer has the ability, you can also mix dull and gloss so you can have both on one piece. A flood varnish covers the entire page. Flood varnishes can be glossy or dull and they can be tinted if needed, however they cannot be both glossy and dull at the same time. You can have a flood with a spot varnish, depending on your printer and what they use for varnishes. This process can be different, so speak with your printer if you want to mix it up a little. Just as you have dull paper, you can have a dull varnish. It produces an area on the piece that will not reflect light in the same manner, which can be used to make colors fade into the background. It can also feel a little rough to the touch, depending on the varnish used. Like gloss paper, a gloss varnish makes colors pop. It can protect certain inks as well. Metallic inks or deep, rich colors like a four-color black tend to show finger prints and scuffing, so covering them with a varnish helps to hide the finger prints and protects it from scuffs. An aqueous coating is similar to a flood varnish. Aqueous coatings are faster drying and more cost effective. They aren’t quite as glossy or dramatically dull as a flood varnish. In most instances, an aqueous coating is a good alternative. Speak to your salesperson about which might work best in your situation. Digital presses use a dry ink to create a dull or matte finish on printed pieces. It can work very much like a dull spot varnish. These inks can also be tinted to enhance other colors. Not all digital presses have the capability of our Nexpress, so check with your printer. A digital flood gloss varnish. It adds a very glossy surface to the digitally printed piece creating a feel very similar to lamination. This can be performed only on certain digital presses, such as our Nexpress, so check with your printer. Dimensional Clear Dry Ink used on the Nexpress it is a dry ink that creates a clear “raised” layer on top of a page element. It can be used to enhance graphics, text, or a full color image. The overall tactile effect is similar to thermography, but with a greater degree of control—Dimensional Printing can be set to produce variable heights, so you can more closely mimic the texture of a specific image. Unlike thermography, which can only be applied to ink, Dimensional Clear Dry Ink does not require ink or an image to adhere to the substrate.